Apple’s augmented reality glasses could be available in Apple Stores as early as 2020, with Apple reportedly prepping for a 2019 unveil. According to a report from Bloomberg, Apple is planning not only the new device, but a whole new operating system for it to run on called rOS (which stands for ‘reality operating system’). At the moment the plan seems to be that there will also be a whole new app store for AR content, along with Apple creating hardware for the device, including a custom chip to tackle the computational requirements and graphics. One of the major tasks for Apple will be getting the device slim and sleek enough that it fits into the design language that we’ve come to know from the minimalist manufacturer. The augmented (and ‘mixed’ if we’re using Microsoft’s term) reality devices that we’ve seen on the market so far have a look that would look definitely look out of place alongside the iPhone X. While Apple is testing out numerous control methods, it's possible that the device will be controlled using gestural commands (similar to Microsoft’s HoloLens), as well as voice integration with Apple’s digital assistant Siri, and a smartphone app. 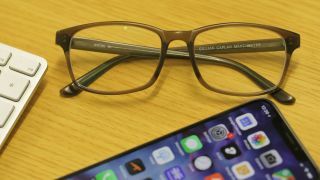 The Apple Glasses rumors are coming thick and fast at the moment, with the Chairman of Apple supplier Catcher Technology hinting about the development of AR technology just two days before time of writing. Apple CEO Tim Cook has never been shy about his passion for AR, and with its push into AR with ARKit, it was always going to be a matter of time before we saw augmented reality glasses from the tech giant, but given Apple’s position in the industry it’s exciting to see that its release could be so soon. Still not 100% sure what AR is? Check out: What is augmented reality?